I tried creating something new tonight. My execution wasn't the best, but it's definitely a technique that I want to try again and get better at. I combined the techniques of glitter placement and stamping decals. I really wanted to do some glitter placement for one of the manis in this weeks prompt. But full glitter placement manis take about 2-3 hours to do, and whilst I do love them (and actually don't mind creating them), I just don't have that sort of time to create a mani when I flying by the seat of my pants to get something painted to post. I was rather disappointed to have to remove this tonight to paint my final design, because it looked super sparkly and was very eye catching. I also used Crows Toes Bifrost, which I bought probably a year ago and it's sat, wasted, in my untried drawer. Bifrost is an amazing microglitter and a totally unique colour combo in my collection. 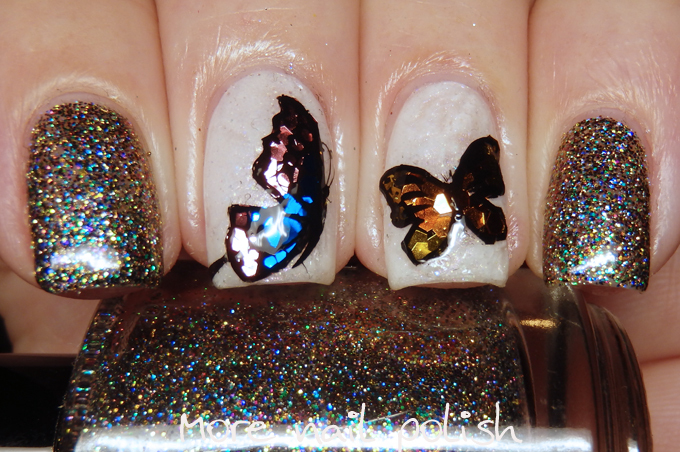 To create the stamping decals I used some butterfly designs off the layered Clear Jelly Stamper plates as my template. After I had stamped the solid background colour onto my silicone mat, I painted a thin coat of foil adhesive to just the butterfly wing parts. 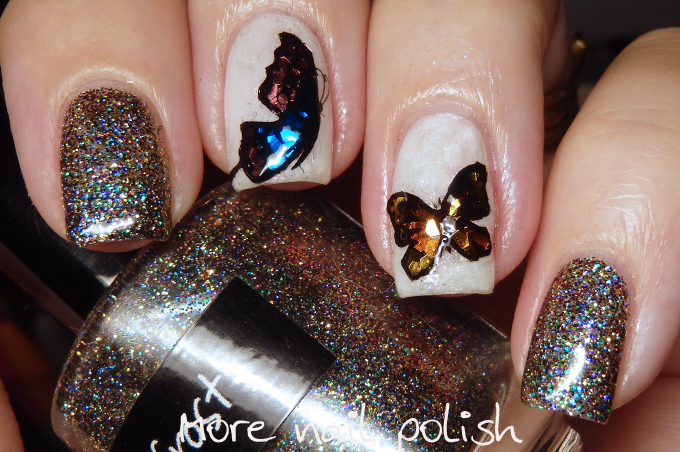 I then used different hex glitters to place the colours into the butterfly wing shapes. 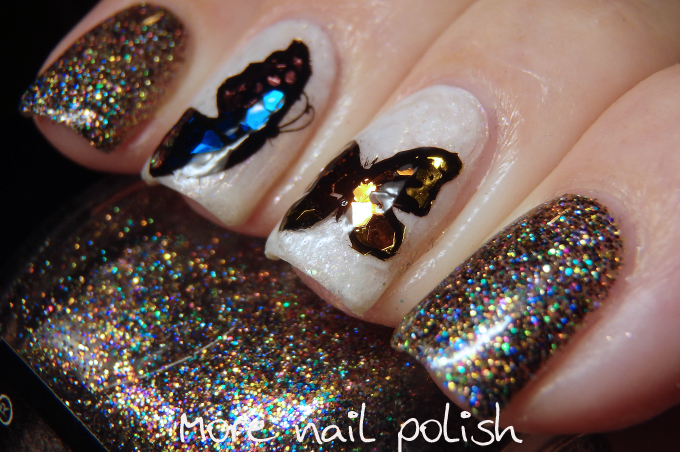 I did then try stamping with the butterfly outlines, but they were too fine and couldn't be seen, so I just outlined each butterfly with a fine brush and some polish. Next was one last layer of top coat, and then I peeled them off my silicone stamping mat and applied them like regular stamping decals. I will try this again soon, and will film it. 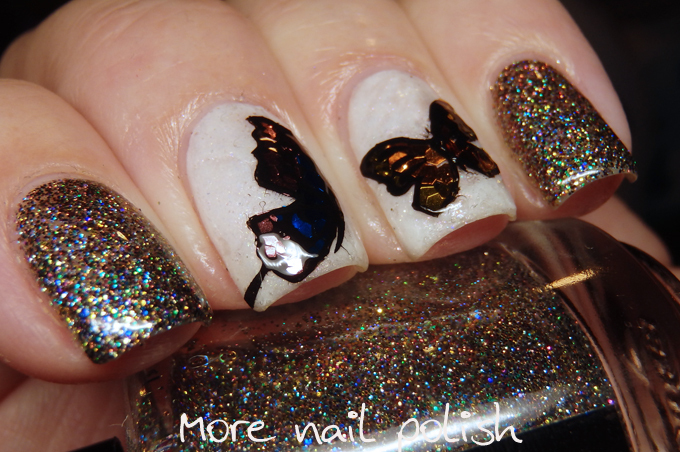 I'd also like to try it with some slightly smaller hex glitters too, as these were just a little bit too big. Wow--amazing job! These are gorgeous!